We will be honoring our Blessed Mother this week. 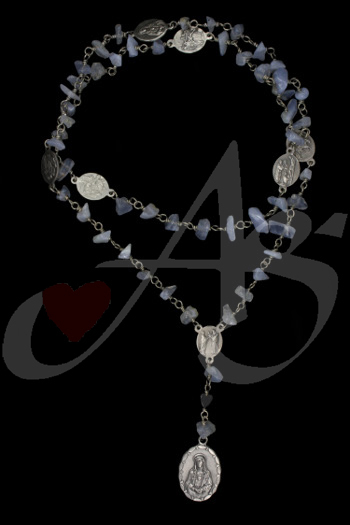 Today’s piece: A full conventional rosary w/ an image of Our Blessed Mother in the center. 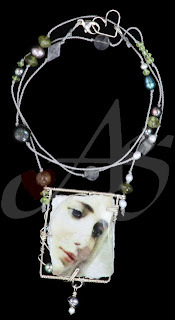 Hand twisted nickel wiring with a handmade image medallion in the center, with a prayerful image Our Lady and evoking prayers to Mary on the back. This piece was commission for a Marian nun – hence the reason for the blue howalite stones. This piece is currently not available. If you would like this piece, a similar piece, or any unique piece of jewelry; contact us! Don't forget to stop by our Facebook page, Google+ page, Twitter, Pinterest, or our website. We will be honoring our Blessed Mother this week. Today’s piece: A contemporary copper and leather necklace of Mary and baby Jesus. I wire wrapped a glass piece and a rose quartz resembling Our Blessed Mother holding Baby Jesus. Very settle tender statement. 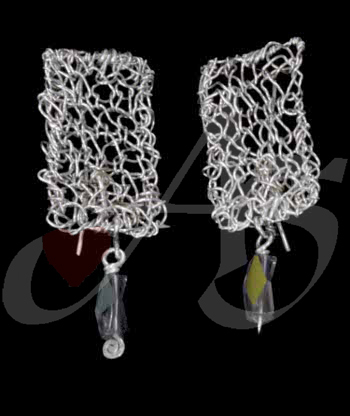 The necklace is also adjustable to be worn at various lengths to properly adorn your outfit. This piece is currently not available. If you would like this piece, a similar piece, or any unique piece of jewelry; contact us! Don't forget to stop by our Facebook page, Google+ page, Twitter, Pinterest, or our website. We will be honoring our Blessed Mother this week. Today’s piece: Hand twisted Sterling silver wire Image necklace of Mary. This piece is one of my all time favorites (a special friend owns it). I love the gentle look on her face and the way the stones are hand knotted in the silk cord. This piece would always invite a passerby to stop and comment on the piece – and yes opening a door for conversation about our Blessed Mother. Most beautiful in person – you can feel the presence of Mary in this image. I love it! This piece is currently not available. If you would like this piece, a similar piece, or any unique piece of jewelry; contact us! Don't forget to stop by our Facebook page, Google+ page, Twitter, Pinterest, or our website. We will be honoring our Blessed Mother this week. 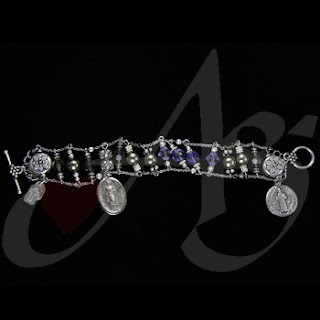 Today’s piece: A Full Rosary bracelet w hand made toggle. 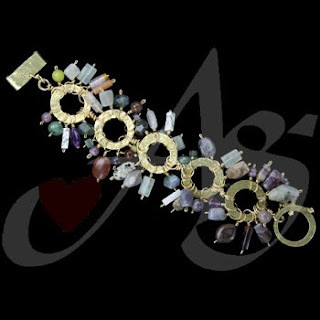 Hand manipulated and twisted brass metal w an array of earth tone stones. Each circle (5 mysteries) has the full ten beads for praying. This stately bracelet looks extremely fashionable with jingle music too! Great evangelization tool, as well as a reminder of Mary and Jesus’s love for us! This piece is currently available. If you would like this piece, a similar piece, or any unique piece of jewelry; contact us! Don't forget to stop by our Facebook page, Google+ page, Twitter, Pinterest, or our website. We will be honoring our Blessed Mother this week. Today’s piece: Seven Sorrows of Mary Chaplet. 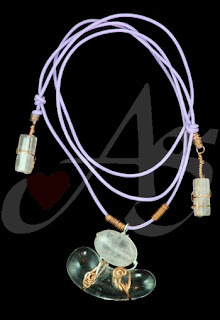 Handtwisted nickel wire w beautiful blue lace agate. A journey prayer of Mary’s sorrows in her life, all reflected around Jesus of course. 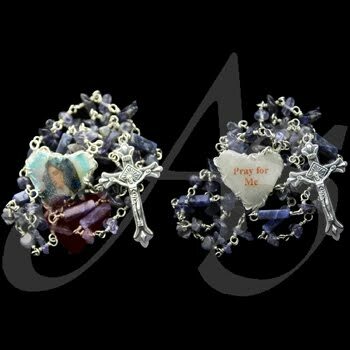 A hidden chaplet that not many know about – look it up you may want to get one of these little beauties! This piece is currently available. If you would like this piece, a similar piece, or any unique piece of jewelry; contact us! Don't forget to stop by our Facebook page, Google+ page, Twitter, Pinterest, or our website. Today’s piece: A double-sided sterling silver polymer leather necklace. The part I am most proud of this piece is the adjustable strap that I designed. It looks very complicated but it does easily adjust to various lengths; my engineering mind-set of seeing a vision and problem solving the execution. Look at the piece, see the word JOY scrolled in the curly Qs and on the flip side a window of hope; just a little reminder of God’s love for us! This piece is currently available. If you would like this piece, a similar piece, or any unique piece of jewelry; contact us! Don't forget to stop by our Facebook page, Google+ page, Twitter, Pinterest, or our website. Nice cozy day to stay home and create... yesterday I worked on several rosaries... my hands were throbbing so today I think I will stay away from 20g wire (making heavy manly rosaries). I need to upload a picture of my design table... ADD site at best! Lots of projects being created! Today’s piece: Is from the FusionLine –two choker necklace options, bracelet and longer necklace. The bracelet makes music to the ears with just enough jingle… I love it! I know precious metals are expensive so I work hard to make it go a long way. 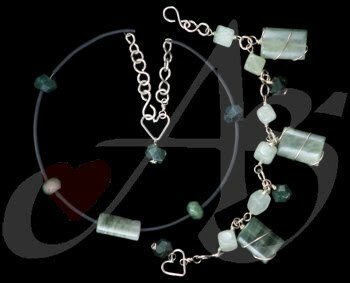 This piece has sterling silver hand twisted wirework and Aventurine and Moss Agate stones – truly beautiful gems. This piece is currently available. If you would like this piece, a similar piece, or any unique piece of jewelry; contact us! Don't forget to stop by our Facebook page, Google+ page, Twitter, Pinterest, or our website. Today’s piece: Hand knitted fine silver wire earrings; I hand knitted the 26g fine silver wire w/ #1 knitting needles, (yes my hands hurt afterwards – but worth it). 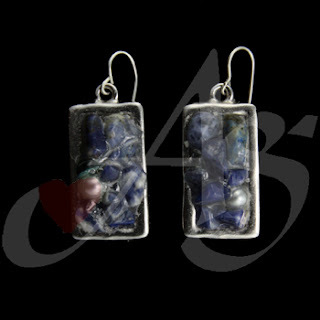 These earrings also required some creative engineering work for the backing, challenge met and the backing works great. I have always dreamed of knitting wire back when I was in university art school, so I guess these earrings are dream come true! This piece is currently not available. If you would like this piece, a similar piece, or any unique piece of jewelry; contact us! Don't forget to stop by our Facebook page, Google+ page, Twitter, Pinterest, or our website. 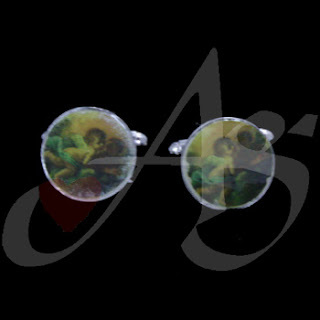 Today’s piece: Angel cuff links for men. I am really working hard to increase my men’s wear line! I actually have male customer’s come up and comment, “probably nothing for me here.” I exclaim. “Oh yes there is!” In fact, this fall will reveal more men’s art wear – literally wearing their faith on their sleeve! This piece is currently not available. If you would like this piece, a similar piece, or any unique piece of jewelry; contact us! Don't forget to stop by our Facebook page, Google+ page, Twitter, Pinterest, or our website. 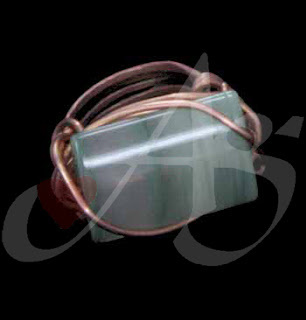 Today’s piece: Copper hand twisted wire around Aventine stone ring. I was so happy with the outcome of this ring and to top it off one of my best friends owns it! I loved the look on her face when she opened the box! The reason for today’s feature? – It is her birthday! This piece is currently not available. If you would like this piece, a similar piece, or any unique piece of jewelry; contact us! Don't forget to stop by our Facebook page, Google+ page, Twitter, Pinterest, or our website. 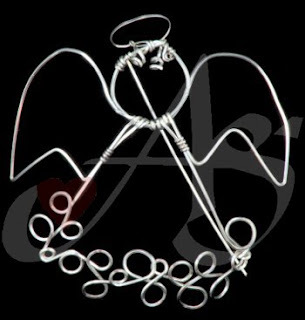 Today’s piece: Sterling Silver hand twisted wire angel. I love making wire angels – just a reminder that you always have someone watching over you. Remember to beckon their help when in need – that is why God gave them to us! This piece is currently not available. If you would like this piece, a similar piece, or any unique piece of jewelry; contact us! Don't forget to stop by our Facebook page, Google+ page, Twitter, Pinterest, or our website. Today’s piece: A specialize commemorative family rosary. I cannot help but staying with the family theme this week and praying for family daily is necessary. 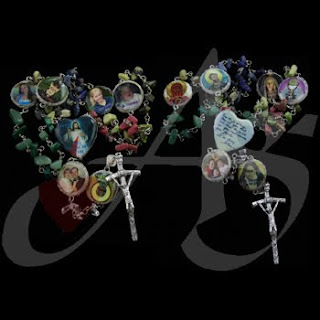 This rosary is a wonderful tool to do just that, pray for each family member and invoke the Saints intercession. I love interviewing the family to put together a perfect personalized piece of spiritual artwork. This piece is currently not available. 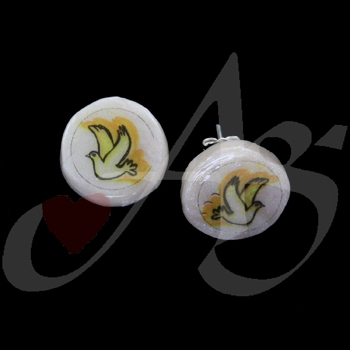 Today’s piece: Holy Spirit Earrings because this time last year everyone was at church pleading for peace and invoking the Holy Spirits presences to be active in our America. May those souls of 911 rest in peace and may the families find peace in their hearts. Come Holy Spirit into our daily lives and lead our footsteps. This piece is currently not available. If you would like this piece, a similar piece, or any unique piece of jewelry; contact us! Don't forget to stop by our Facebook page, Google+ page, Twitter, Pinterest, or our website. Today’s piece is a rosary bracelet displaying our American colors in honor of 911 – may those souls rest in peace and may the families find peace in their hearts. 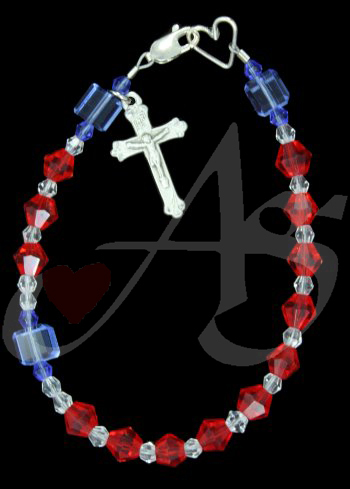 This rosary bracelet is made of sterling silver and crystals – wonderful quiet reminder to pray each day for our military. This piece is currently available. Today’s piece should have been posted on Sunday to celebrate Our Blessed Mother Mary’s Birthday! The earrings are a collection of various blue stones with a pearl: Perfect to wear with a pair of jeans or a beautiful blue dressy outfit. This piece is currently available. Today’s piece is a hand cut and textured brass zipper pull with a 20g nickel wire wrapped and coiled about the pull. Great way give a little artiness to a piece of clothing or purse. This piece is currently available. If you would like this piece, a similar piece, or any unique piece of jewelry; contact us! Don't forget to stop by our Facebook page, Google+ page, Twitter, Pinterest, or our website. This Rosary Bracelet is made with multi-shape faceted purple Swarovski crystals, round sheen green faux pearls and round faceted brown Swarovski crystals. This piece has toggle fastenings and findings. This item is decorated with a mixed medals. If you would like this piece, a similar piece, or any unique piece of jewelry; contact us! Don't forget to stop by our Facebook page, Google+ page, Twitter, Pinterest, or our website for more religious pieces of jewelry. Today's piece is a watch. This is not an ordinary watch. 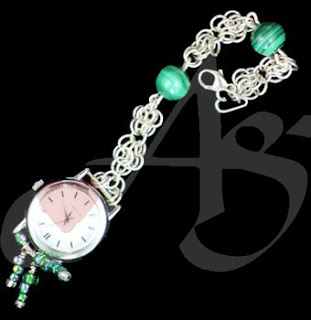 This watch is made with sterling silver chainmaille. However, rather than wrapping around your wrist, it is worn on whatever you'd like to link it around: belt loop, purse handle, desk handle… it is truly versatile! The green stones are malachite. This piece is currently available. If you would like this piece, a similar piece, or any unique piece of jewelry; contact us! Don't forget to stop by our Facebook page, Google+ page, Twitter, Pinterest, or our website for more intricate pieces of jewelry. Today's piece is a pair of cufflinks. These cufflinks are made with brass sheet metal. The base is hand stamped and filled with green polymer clay to add dimension. The centerpiece is a raised platform on green polymer clay. The image is of St. Patrick. This piece is no longer available. If you would like a similar piece, or any unique piece of jewelry, contact us! Don't forget to stop by our Facebook page, Google+ page, Twitter, Pinterest, or our website for more magnificent pieces of jewelry!